I may have posted this picture before. It's from the archives as I haven't had time to do the photography that I want to do. This is a seed grown Haworthia truncata, with the seed selected from larger growing specimens, sometimes labeled "crassa". This particular one has some very nice coloration and markings. If you observe it, I hope you had a fun Halloween. I've posted this plant before on the blog but only yesterday listed it at our nursery. It's Agave guiengola 'Creme Brulee'. Originating from the Guiengola limestone cliffs of Oaxaca in Mexico and originally sold with the invalid cultivar name Agave guiengola 'Marginata', it now goes with the more colorful name of Creme Brulee. 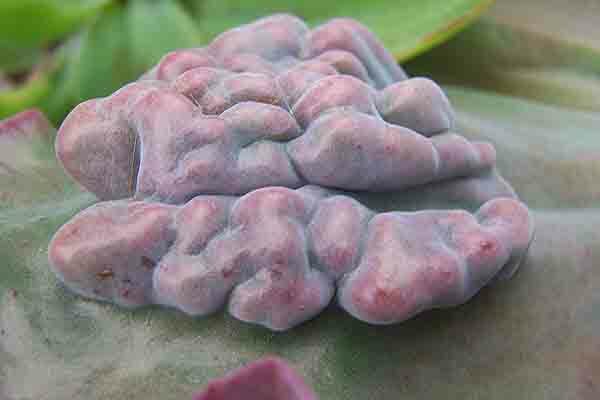 The pink on the edges tends to come with the brighter light of summer, becoming lest noticeable during the winter months. We've fallen in love with this plant so I couldn't resist posting it again. The Statesman Journal, the newspaper serving the Salem, Oregon area, had an article on Thursday about growing cactus and agave plants in the Northwest. They then visited the outstanding xerophytic gardens of Ron McKitrick over in Yakima, Washington (the Hillside Desert Botanical Gardens). Though certainly worthy of a visit, the 6 inch annual rainfall east of the mountains certainly provides for different challenges than found in the rainier portions of Oregon and Washington. I'll be looking forward to future installments. We now have a celebrity cactus in our collection, "Beth" the barrel cactus. It all began with a phone call from Lori Fitch at the Portland, Oregon Friends of Chamber Music, asking if we had a small barrel cactus which we could loan for a "not so classical" performance of So Percussion. This is the cactus which was loaned and concert goers named it (or her) "Beth". I wasn't able to attend, but I understand she was a big hit. Introducing "Beth", our first musical cactus! This is one of my favorite "fat leaf" plants, x Graptoveria 'Opalina'. 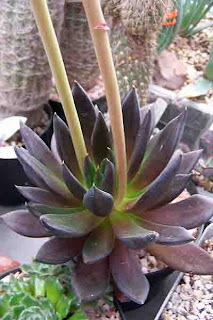 It's a cross of Echeveria colorata and Graptopetalum amethystinum. 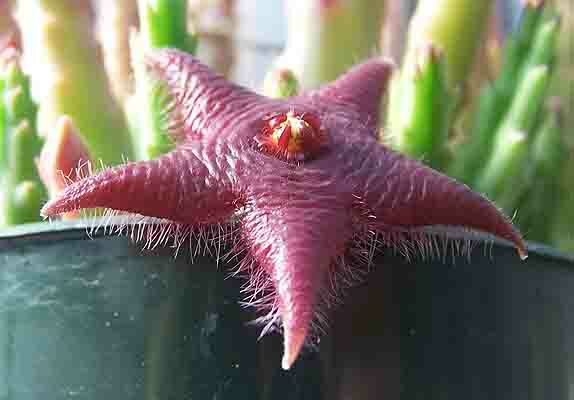 Fortunately, you can't smell this flower via the internet (or is this the next big thing?). 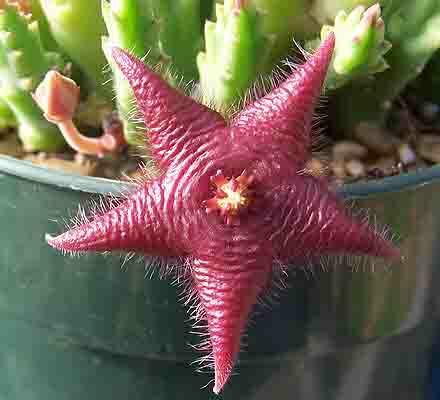 Actually this little Stapelia doesn't smell that bad. 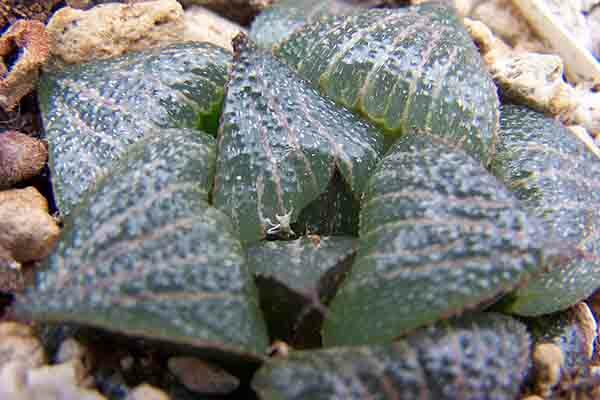 And it's quite small, which with these plants is an advantage - at least to my way of thinking. And flower they do, over and over again. and the second is JDV93-59. They are quite distinctly different plants, as you can see, and both have there own distinctive attractiveness. 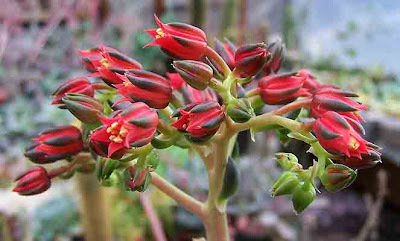 This is another view of some of the Echeveria, showing some of the long flower stalks. Back on Monday. This is a view of a tray of Lithops in our Lithops growing area. We grow most of our plants in trays like this rather than individual pots. 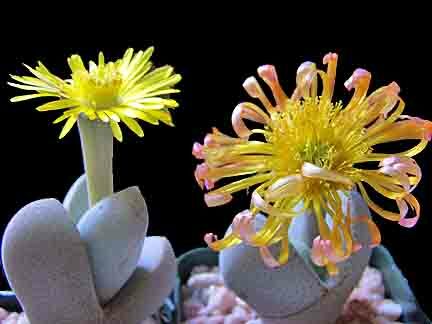 Since we're an internet nursery, it takes up less space and makes for less work.The flower is on Lithops pseudotruncatella ssp. archerae, and if you look closely in the tray, you can see other buds appearing. We really have to stuff to get all the plants in our greenhouses every winter and this is no exception. Here we have some echeverias and a couple of Aloe polyphylla plants Now the big job is getting to them so we can water them and otherwise care for them. Even getting down the aisle to get to them is a major task for me and my big feet. As I've been known to do as Winter approaches, I'm pulling this photo from archives. It's a wonderful African mesemb called Dinteranthus microspermus ssp. puberulus. These are summer growers and they're quite easy to grow...good drainage and don't over-water, especially during the winter! Had an enjoyable evening with other Lewis & Clark College alumni (my undergraduate school, where I majored in philosophy - many years ago). Tomorrow night (or, I guess it's now tonight) I'll be with the Oregon Cactus & Succulent Society. For you local cactus & succulent people, hope to see you there! 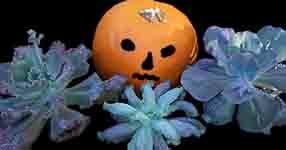 I posted this header on our nursery site yesterday to announce a special. I don't usually tie the two together so much, but it really is a great deal. 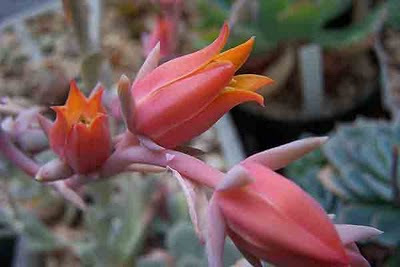 Echeveria 'Mauna Loa', E. 'Etna', and E. 'Culibra' are all on sale for less than half price. Some real lumpy, bumpy wierdness for the scary season. But enough of the shameless commercialism. We've been really busy the last few days and things should slow down a bit this week. Took a nice 12 mile bike ride today but my bike had a flat, so it was only a 6 mile bike ride. The rest was walking. And for those in the Portland area, check out the Oregon Cactus & Succulent Society page for info on our next meeting this Thursday. We'll be auctioning off some very nice Hoya plants and the program will be on those scary monster cactus... See you there! This morning, before going to church, I decided to do a little yard work. I was raking the area next to the entry walkway when the rake disturbed a yellow jacket nest in the ground. Before I even knew what was happening I was literally covered in yellow jackets...and they weren't happy. I ended up with about 10 stings from the top of my head to several toes. The stings are still rather painful, especially my big toe. So... I'm off to bed. I'm hoping for a better day tomorrow. Since I'm on an older computer for a day or two I don't have access to my more recent photos, so I'll share a few older ones. These photos were taken about 5 or 6 years ago. 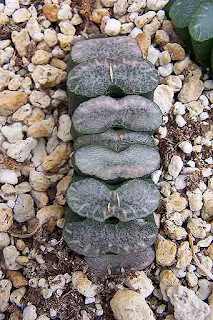 This is Astrophytum capricorne and its fantastic flower. But, of course, we're about flowered out here as we enter into the Fall and Winter seasons. In passing I mentioned the matter of trademarks for plant names. 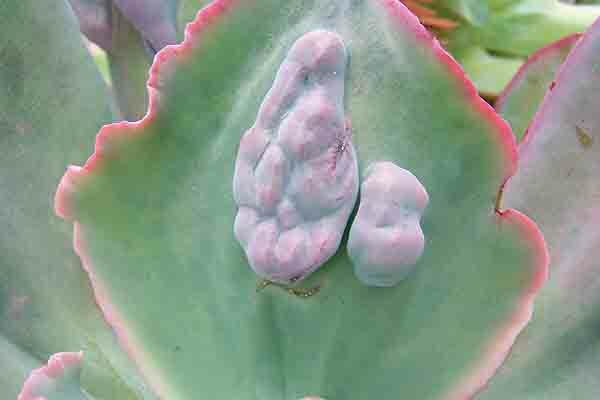 In the past we didn't have to deal with trademarks in succulent plants; that was the headache for the rose people. But now they're all over the place. Just what is a trademark and how is it appropriate in relation to the names of plants? We already have a system for naming plant cultivars by simply publishing the cultivar name (which must be in ordinary language). Such names can be used by anyone, freely. Principle 4 of the International Code of Nomenclature for Cultivated Plants 2004 states that "Names of plants must be universally and freely available for use by any person to denote a distinguishable group of plants. In some countries, plants are marketed using trademarks. Such marks are the intellectual property of a person or some corporate body and are not therefore freely available for any person to use; consequently, they cannot be considered as names." But now we have businesses trademarking cultivar names, though it's my understanding that the US Patent and Trademark Office (USPTO) is opposed to the use of trademarks for cultivar names of plants. Remember. 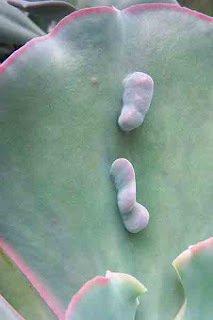 A TM on a plant does not prohibit the propagation and redistribution of a particular plant. Plant patents are available for that purpose. And if the TM is applied to an already accepted cultivar name, it certainly is inappropriate if not illegitimate. I posted a photo of this Kelly Griffin hybrid earlier this summer...and I think it was a better shot than this one. 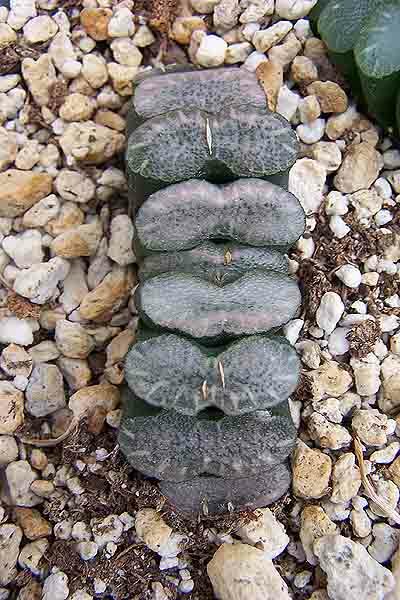 Like most of these hybrids, they stay small and make a great pot specimen. The name is apparently trademarked by Proven Winners but they're available elsewhere in the trade other than with them. This is one of the Kelly Griffin hybrids: 'Donnie'. 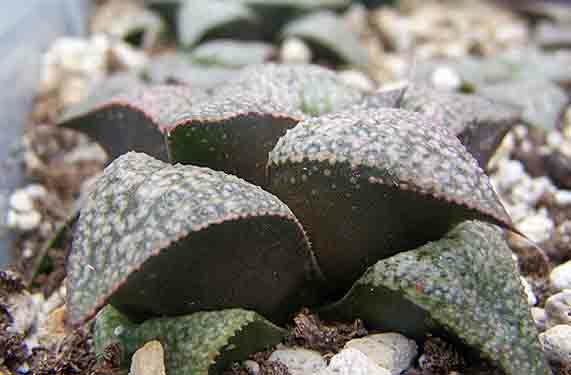 The red edge, along with the white striping, makes for an outstanding, small growing Aloe. We're haven't really kept up to date on our Rhipsalis and Lepismium taxonomy so any help in naming this would be appreciated. I'll be posting a few we have and asking for your help. If you can attach the correct genus and species to the plant, you win the prize...my grateful appreciation! ... What? You expected more? There's more to come in the days ahead. A young Aloe polyphylla, just beginning to show it's spiraling characteristics. 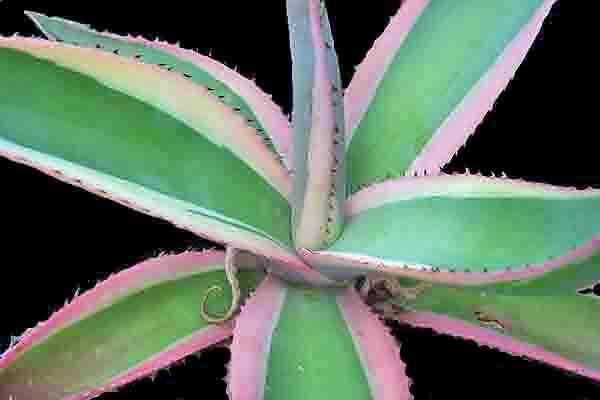 Commonly known as the "Spiral Aloe" due to the beautiful spiral formation of the leaves in mature plants, but in Afrikaans its common name Kroonaalwyn translates as "Crown Aloe". From Lesotho in South Africa, it's endemic to basalt rock outcroppings within grasslands in the higher elevations between 6,500 and 8,200 feet of the Maluti Mountains. Quite hardy (5-10 degrees F) if given excellent drainage. OK. I've got the name of this crest outside on the deck. It's midnight and I'm ready to get some shut eye, so the name will have to wait. We have the normal and it tends to throw crests fairly often. Our weather's definitely Fall like, about 10 degrees (F) below what it should be at this time. Oh well. 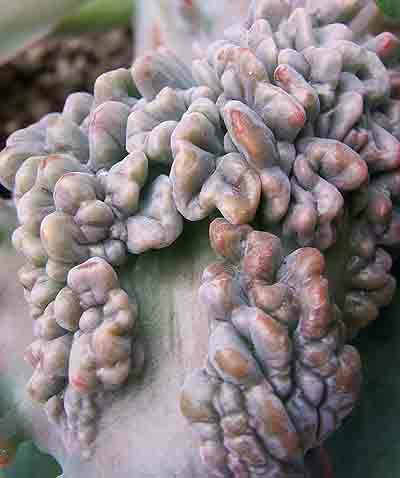 No flower tonight, but a plant which is as good as a flower: Echeveria 'Fancy Frills'. I think this picture explains the popularity of echeverias. Tomorrow I'll be doing more work moving plants into the greenhouses and getting the greenhouses ready for winter. (The following is political comment. Feel free to disagree or to add your two cents or to totally ignore what I have to say.) If I didn't have so much to do I'd probably be down at Portland's Tom McCall Waterfront Park joining with the young people who are beginning an "Occupy Portland" protest in solidarity with the New York City "Occupy Wall Street" group. Somehow the money has to be taken out of the political process here in the United States. A billion dollars per candidate to run for the presidency is outright ludicrous. And we know who bankrolls their place at the table: the big banks and the huge international corporations. There. I've had my say. 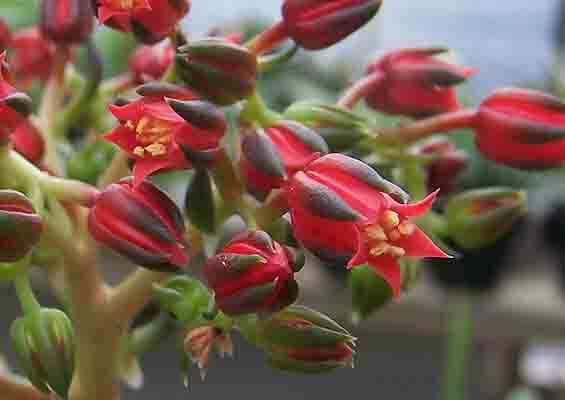 Having had strong political views for a long time, having been a minor part of the civil rights movement and the Vietnam War protests, I will probably be starting a separate political blog pretty soon so that I can stick to succulent plants and beautiful flowers here. 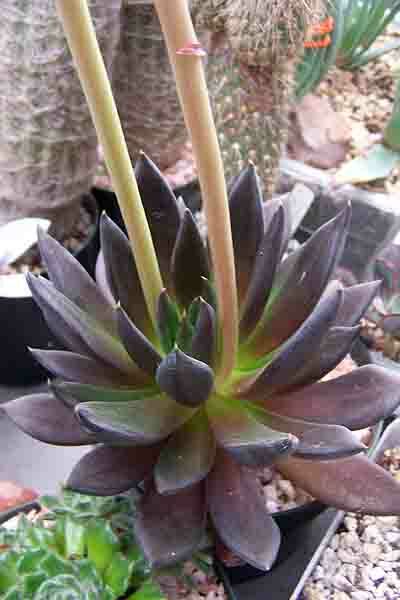 Just across the aisle in the same greenhouse is this flower: Echeveria 'Black Knight'. Again, not huge, but when you get this many flowers clustered together and distinctive flowers at that, it can't help but be impressive. Got a couple of large order processed so they can go out this week with a couple more that are awaiting preparation. Our customers this week are from China, Thailand, San Francisco and Los Angeles. Tomorrow morning, though, a break to have Lattes with friends at a local coffee shop. Then it's back to getting the plants readied for the colder weather that's on the way. 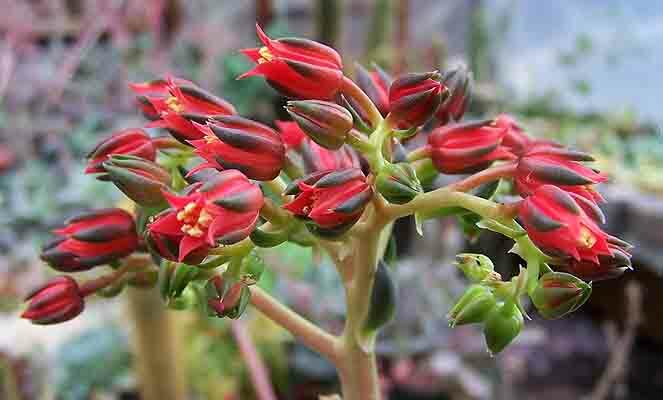 In general most Echeverias are grown, not for the flower, but for the plant itself. But don't overlook the flowers. This is the flower of Echeveria 'Lucita'. It may not be huge, and it may not be as attention grabbing as a caruncle, but it's worth a lot more attention than it generally gets. After that faded flower I thought, maybe a few caruncles! That's not a term that you'll come across very often, unless you're talking about a chicken's wattle or certain kinds of Echeverias. Some people are really turned off to them, finding them almost revolting. Others find them fascinating and love them. In my experience, people either love or hate them; there's not much middle ground. Here are a few examples that I took pictures of earlier today. I think you can understand why some of these plants have volcanic names. 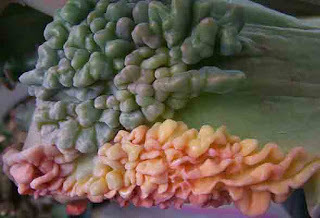 And for those of you who find these pictures revolting...tomorrow we'll return to flowers! I should have taken time to photograph this flower yesterday or the day before. When you wait too long, what you get is a flower on it's last legs. This crest came to us unnamed, but we can be fairly certain it's a Ferocactus - just don't know which one. If you look closely you can see the spiders have been busy this summer, doing their part in the environment. We don't have any really dangerous spiders here. The Black Widow spider is very rare - with most of my life lived here I've only seen one west of the Cascade mountains. And the Brown Recluse, if it's around at all, is just that: reclusive. Mostly it's the common garden spider. And those are common. As we take these back into the greenhouses they get sprayed with a good blast of water to get rid of all the webbing and then they'll get some pre-winter systemic insecticide. After that...let's get it over with...Winter, that is! Oops! Sometimes there are days that are like that! 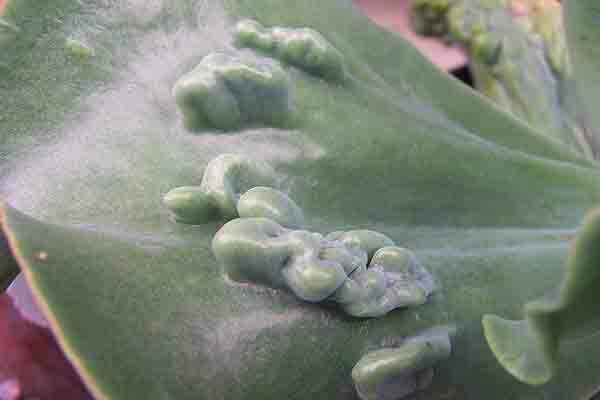 This image was shared by Flávia Fernandes on the blog Cactos e suculentas by Flávia Fernandes. Thanks. Actually, today wasn't quite that bad. The weather was great and we had our children and their families over for our bi-weekly gathering. One highlight was when our two granddaughters, Lynn-Marie & I took Kiani and Osita (our two Belgian Tervuren dogs) and Ladybug (our miniature horse) for a walk through the neighborhood after dark. We had a lot of fun together. Back to my own pictures tomorrow. And enjoy your plants, but don't let any cactus fall on you!